In August, my wife and I took an exploratory trip into the Kaibab National Forest southeast of Williams Arizona. We set-up a base camp at Wild Horse Lake Campground and from there ventured out to see what the country was like. We visited Dog Town Reservoir, JD Cabin, JD Dam, Sycamore Point, and hiked to an abandoned fire lookout tower on Round Mountain. The campground is large and well-developed. Although all roads to the lake are dirt, the campground roads and parking pads are paved. There are concrete tables, fire rings, and tent pads. Drinking water is available. Toilets were clean and of the pit variety. One rule that surprised us was that if you bring in firewood, you must take it with you when you leave. It is not allowed to be left for the next camper. The water level at White Horse Lake was very low. The camp host said that it had not been stocked all summer. It was still quite a scenic view especially at sunrise and sunset. While there may not have been many fish, there were thousands of frogs. That is something that you do not see around the lakes of southern Arizona very often. The old homestead that we visited was identified on the map as JD Cabin and Grave. It is northwest of White Horse Lake. Forest Service info identifies the site as having belonged to James Douglas who is buried nearby. The area was settled in the 1870's. There is the cabin, a barn, and an old corral. The buildings seem newer than the 1870's since they are primarily constructed of recycled railroad ties. There are the remains of an old log building that may date to that earliest period. We did not spot the grave site. Northwest of JD Cabin is Dogtown Lake. Although its water level was also lower than normal, we did paddle around it. We had no luck at catching any fish. The Ospreys and Blue Herons seemed to do better. The campground at Dogtown is not as developed as the one at White Horse Lake. Bill Williams Mountain is clearly visible from the lake. South of White Horse Lake is JD dam. The water body backed up by the earthen dam is much smaller than either White Horse Lake or Dog Town Lake. The area is designated as day use only. There is fishing allowed, but it is a catch and release, barbless hook, lure only tank. Near JD dam, is the road out to Sycamore Point an overlook high on the rim of the Sycamore Canyon Wilderness. The road is pretty rocky and probably not really suitable for passenger car traffic. The road is designated as an official Bike Ride route. We saw several signs similar to the one here on our rides on the backroads of the forest. The area is very bike friendly. 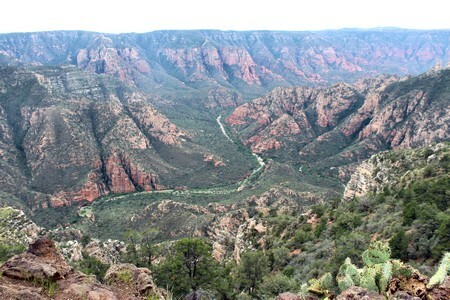 The view down into Sycamore Canyon from Sycamore Point is spectacular! A single photograph does not do it justice. This short video perhaps gives a better impression what the view from Sycamore Point is like. The official Kaibab National Forest Map shows a fire look-out on the top of Round Mountain. 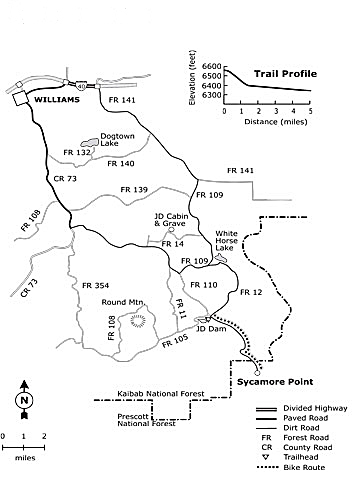 The map shows a short spur road from FR 138 to the lookout. It was too rough for my truck loaded with kayaks. So we walked in about 1/2 mile. It was difficult to tell whether the tower was abandoned or had been vandalized or both. It was possible to climb to the observing hut. As might be expected, the views from the top of the tower were great. To the northeast were the San Francisco Peaks, the northwest Bill Williams Mountain and to the southeast the Sycamore Canyon Wilderness. The Kaibab Forest managers have done a good job of thinning out the "extra" growth in the forest. There is little undergrowth which leaves the tree stands to be very park like in appearance. There are also many large open grassy meadows. It was a very pleasant place to visit.